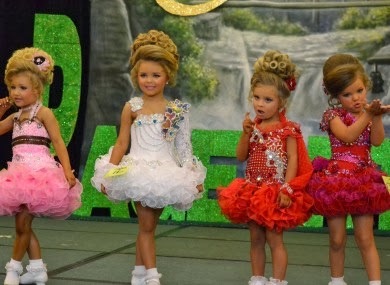 So have you entered your daughter in the Universal Royalty Beauty Pageant this weekend? Me neither. Kind of a no-brainer. Kind of not worth writing a blog post really, as there’s nothing to debate, the argument makes itself. And I’ve just read that the Bracken Court in Balbriggan, revealed this week to be hosting the pageant, has pulled out. A very admirable decision. There are two reserve venues booked according to the contest organiser. It will be very interesting to see if they pull out too – what a strong message it will send to the organisers if no venue in Ireland will host their pageant. No need for active protest at all perhaps – which might not be a bad thing. I think the Irish don’t love protesters, and it could have the adverse effect of focusing attention on the protesters rather than the pageant itself, in a “down with this sort of thing” way. So perhaps it will all come to a quiet end, the organisers going back to Texas, tail between legs. But having said all that, I guess there is cause for at least a little debate – there must be some people in this country who don’t think there’s anything wrong with parading children in beauty contests – there has been “huge interest” from Irish parents according to this report, with over 100 entrants. So at least one hundred sets of parents are either not aware or are not convinced that entering their eight year old daughters in a beauty pageant sexualises them at a horrifyingly young age and at the very least teaches them that how you look is what’s important in life. Not working hard to develop a talent or to excel at sport or to study at school. In a swimsuit – yes, there is a swimsuit section for children. Seriously, there isn’t any need to even make this argument, is there? I am trying not to be a judgy parent. I’ve judged other parents over the years, and subsequently completely changed my opinion on the very same criteria on which I judged. I once thought that bringing a baby into your bed to sleep was at best a slippery slope and at worst, dangerous. Now I see it as the ideal place for a restless baby; happy and comfortable next to the people who make him feel most secure in the world. But I don’t judge people who prefer to avoid bringing their little ones into bed – I was that person, I see that perspective very clearly. We all make different parenting choices – sling or buggy, cot or co-sleep, work or stay at home. None of these is cause for judgement. But I can’t find it in me to hold back on judging a parent who is happy to parade an eight year old girl in a contest for a cash prize, where her “talent” is looking as cute as possible, underneath layers of make-up. IN A SWIMSUIT. Sorry for the caps. But sometimes you just have to shout. What do you think? Should we have legislation to ban these contests in Ireland? It’s creepy. Seriously seriously creepy. It’s like a big ‘oh please random strange people – molest my child’ kind of sign. It’s also psychotic mothers trying to relive their youth through the next generation. Like having a child really means having a clone that has to make your own personal childhood dreams come true. Great piece, this sort of thing (yes, as in “down with”) creeps me out big style. I did once enter my daughter – who was just over a year at the time – in a bonny baby contest at our local agricultural show. It was done in a semi-ironic way but I will admit I was a little peeved when she didn’t win, she was clearly the most gorgeous baby there 🙂 But the idea of swimsuit and evening dress sections in a child’s competition is seriously unnerving. Little girls – and we should never forget that’s what they are – should not be wearing false eyelashes, fake tan, false nails and having waxes and eyebrow shaping. Previous Previous post: An anniversary and a giveaway!